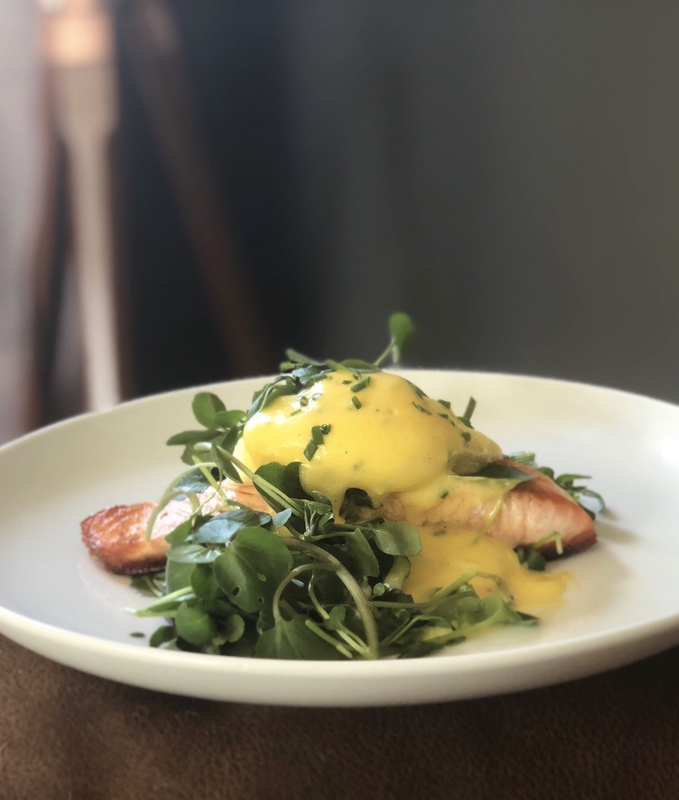 Its Seafood Week so I thought it was only appropriate for my Love Watercress recipe this week to be Crispy skin salmon with watercress, poached egg and hollandaise sauce! To start place the peppercorns and white wine vinegar for the hollandaise sauce into a small saucepan. Place on the hob on a high heat and reduce until approximately 1tbsp of vinegar is left. Strain into a ramekin and leave to cool. In a large bowl add the 2 eggs yolks, a large pinch of salt and the cooled vinegar. Place above a pan of simmering water and whisk till it starts to lighten in colour. Start adding the butter one cube at a time, making sure each cube is fully incorporated before adding the next. When fully incorporated if it is too thick you can add a splash of water to loosen. Check the seasoning and add more salt, pepper or vinegar if needed. Place to one side in a warm place. Boil the kettle. Place a frying pan and a shallow saucepan onto the hob on a high heat. In the shallow saucepan add boiling water, 1tbsp white wine vinegar and a good pinch of salt, reduce so the water is just trembling. Rub the salmon with rapeseed oil and season well with salt and pepper. Place in the frying pan skin side down, as it cooks you will see the colour changing up the side of the fillet. Once the colour has changed halfway up the fillet remove the pan from the heat. Turn the fillet over and the residual heat from the pan will finish cooking the salmon through. Whilst the egg is cooking, in a bowl add the 1tbsp rapeseed, salt, pepper and watercress and toss together. Finely chop a few chives. Place a good pile of watercress on to two plates. Once the three minutes is up remove the eggs from the water with a slotted spoon and onto some paper towel to drain. Place a salmon fillet onto the watercress and top with a poached egg. Spoon a good helping of the hollandaise sauce over top of the poached egg and sprinkle over the chives. Enjoy your Crispy skin salmon with watercress, poached egg and hollandaise sauce!